With our system of rails FRP cylindrical section, we offer a total solution for assembly with our pipes and accessories you can easily assemble. 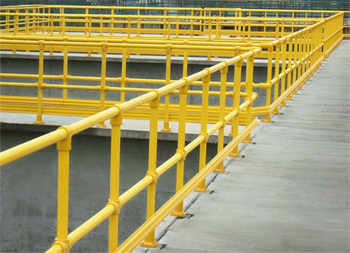 Nioglas railing system consists of cylindrical tube connectors manufactured by pultrusion and easy assembly. Its good resistance to chemical and atmospheric agents are highly recommended in the chemical industries, platforms and walkways in marine environment, wastewater treatment, desalination, etc. · Platforms and walkways in marine habitats, wetlands, etc..
· Industrial plants, purifiers, desalination, etc. 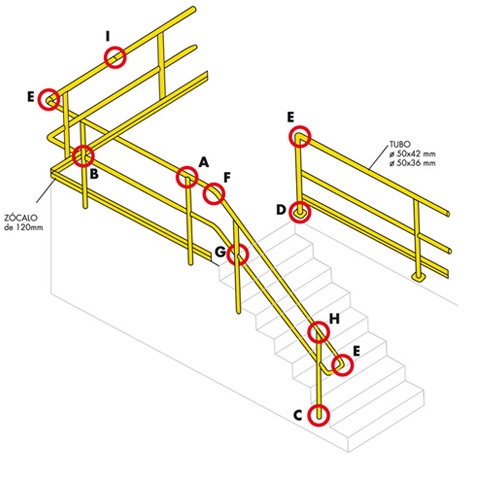 · The rail and the posts are tube ∅ 50 m / m ext. for ∅ 42 and ∅ 36 mm int. WITH inihidor UV. · Very resistant to degradation from external agents. · Fix components with adhesive and rivets | screws. · For greater resistance to external agents is recommended to finish painting. Nioglas manufactures thermostable polyester-glass fibre profiles, by the pultrusion process; it was founded in 1981 as a division of Industrias Nioco, S.L. in Castellbisbal.